What are Elvis Collectibles Records Memorabilia Worth? Elvis Presley’s Gold Piano has join Hard Rock’s priceless collection of memorabilia that including clothing & instruments from legendary stars like The Beatles & Jimi Hendrix. The grand piano was originally purchased for his mother Gladys in 1955 and installed in his home on Audobon Street. 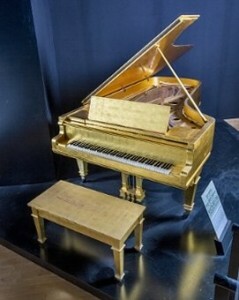 The piano was placed into storage after his mother’s death, until Priscilla Presley decided to adorn the piano in 24-karat gold-leaf as a gift for the couple’s first wedding anniversary. The piano can be seen at Seminole Hard Rock Hotel in Tampa. 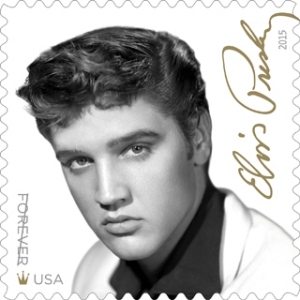 The Postal Service previously honored Presley on a stamp in 1993. The Smithsonians National Postal Museum calls that stamp the most popular U.S. commemorative stamp of all time. This 2015 issued stamp features a 1955 black-and-white photograph of Presley taken by William Speer. In the bottom left corner, between the words Forever and USA, is a small gold crown, a nod to The King of Rock n Roll. Presleys signature, in gold ink, also is featured along the right side of the stamp. 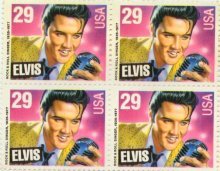 The previous Elvis stamp in 1993 became one of the US Postal Service’s most talked about ever. In a successful bid to generate a buzz, the Postal Service asked the public in 1992 to vote between images of a dashing young Elvis and an older, chubbier one. If you are looking to become a serious investor of Elvis collectibles, the novelty retro items, and vintage toys and clothing produced red in the mid 1950’s reap the best value for money and have the potential to greatly increase in value. Items owned by Elvis (everything & anything) Proof will ascertain its value.